The Blood Angels Space Marines must defend their home world from the ravenous threat of the tyranid Hive Fleet Leviathan. A tendril of Hive Fleet Leviathan has reached the Cryptus shieldworlds. The Imperium musters its strength, for the aliens must be stopped here, as next in the hive fleet's path is the home world of the Blood Angels Space Marines, Baal itself. Many are the battlefields and the price of victory is steep... On Phodia, the sons of Sanguinius give battle to the dreaded Spawn of Cryptus. At Lysios, the Adepta Sororitas and Tempestus Scions hold the line against Leviathan. Far from the fighting, Blood Angels Sergeant Jatiel finds himself pitted against another threat, the necrons of Anrakyr the Traveller who may yet have a crucial impact on the greater war. 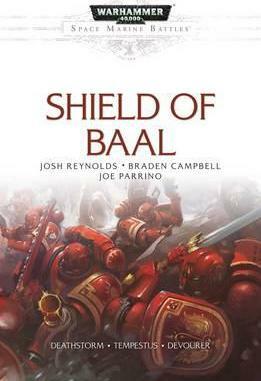 Braden Campbell is the author of the novellas Tempestus and Shadowsun for Black Library, as well as several short stories set in the Warhammer 40,000 universe. He is a classical actor and playwright, and a freelance writer in the field of role playing games. Braden has enjoyed Warhammer 40,000 for nearly a decade, and remains fiercely dedicated to his dark eldar army. Joe Parrino is the author of a range of Warhammer 40,000 stories, including the novella Shield of Baal: Devourer, the audio dramas Alone, The Shape of the Hunt and The Emperor's Judgement, and many short stories, including 'Witness', 'The Patient Hunter', 'Nightspear', 'In Service to Shadows' and 'No Worse Sin'. He lives, writes and works in the American Pacific Northwest. Josh Reynolds is the author of the Blood Angels novel Deathstorm and the White Scars novellas Hunter's Snare and Dante's Canyon, along with the audio drama Master of the Hunt. In the Warhammer world, he has written the End Times novels The Return of Nagash and Lord of the End Times, the Gotrek & Felix tales Charnel Congress, Road of Skulls and The Serpent Queen, and the Time of Legends novels Neferata and Master of Death. He lives and works in Northampton, UK.